It is an object-oriented language. It is a powerful class library. It has massive online support. Following is the step-by-step process of how Cucumber works with Ruby. Step 1 − Install Ruby. Go to RubyInstaller download page. Download the version best suited for your operating system (i.e. 32 or 64 bit). 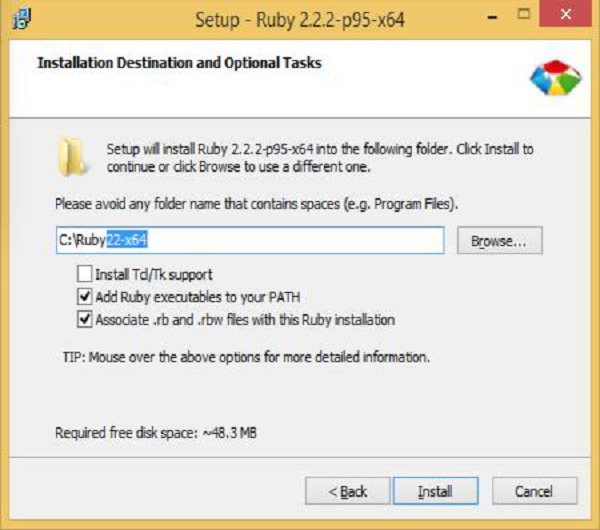 During the installation, tick the option “Add Ruby…” and “Associate …”, as shown in the following image. Step 2 − Download and extract Dev kit. Download the Devkit version best suited for your operating system (i.e. 32 or 64 bit). Extract the devkit at c:\Ruby\Devkit folder. Inside the Ruby devkit, run the following command. Step 3 − Install Cucumber and other Ruby gem. Next, install the gems you need for Cucumber web testing. Step 4 − Install IDE – KOMODO. Download the free trial installer. Double-click on the downloaded exe. Finish the installation and open the IDE. Step 5 − Install Watir − Go to command prompt and run the following command, "gem install watir"
Step 6 − Install rspec − Go to command prompt and run the following command, "gem install rspec"
Step 7 − Create feature file. Click on new file icon. Feature: Users must be able to search for content using Google. Scenario: Search for a term. Given I have entered "watir" into the query. Give the name as CucumberRuby.feature. Step 8 − Create step definition file. Step 9 − Create the test file. Click on ‘New’ file icon. @browser.title == "watir - Google Search"
Step 10 − Run the feature file. A web browser instance will open. Google.com webpage will get loaded. Search text watir will be entered. Search button will be placed. Search results shall be displayed on the webpage. Browser instance will get closed.